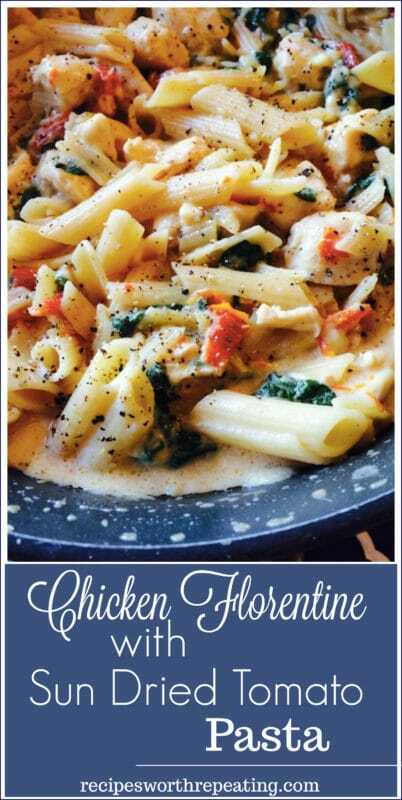 This Chicken Florentine with Sun Dried Tomato Pasta is quick and easy to make! Ready in 30 minutes, this pasta dish is loaded with sun dried tomatoes, chicken, garlic and spinach! Perfect for any weeknight dinner, you’re family is guaranteed to love every bite! Gluten free option available! It tastes as wonderful as it sounds and looks. I know, mouth watering isn’t it? This Chicken Florentine with Sun Dried Tomato Pasta is one of our family favorites and I make it for dinner all the time! A good creamy pasta that includes sun dried tomatoes and spinach…YUM! What is Chicken Florentine anyway? I’m glad you asked!! A traditional Chicken Florentine dish typically lies on a bed of spinach leaves and mushrooms. It typically has a creamy white sauce mixed with garlic, Parmesan cheese, Italian seasonings, and is topped with baked mozzarella. And this recipe is kinda like that with a couple of variations. For example…I made a pasta dish out of this one…because I absolutely love me some pasta! If serving with pasta, you’ll typically see people using farfalle. I used penne because Barilla makes a fabulous gluten free penne version that I love. I left the mushrooms out of this recipe, which is rare…I love mushrooms! I don’t use Parmesan in this recipe. So I switched it up just a little bit so it’s not your traditional Chicken Florentine dish. Let’s talk pasta a minute. People often ask me, “Do you actually eat pasta? Isn’t pasta unhealthy?” Just to be crystal clear…I eat pasta and I eat it often. Like my Garlic Basil Chicken Pasta with Alfredo Sauce and my Penne Pasta with Italian Marinara Sauce. I eat pasta bout once a week, actually. You see, I’m a macro follower. I’m big into lifting weights for muscle gain and growth. And you can’t grow build and grow muscles unless you eat carbs. I am such a huge believer of eating the right amount of the right types of foods, and that includes pasta. Yeah for pasta!! I’m going to get on my soap box for a minute so bear with me. Your body needs carbs, healthy fats and protein. So please, do me the biggest favor in the world and don’t deprive yourself of the foods you actually need! Just eat smart and eat the right amounts of your macros and you will be fine! If you want to talk macro theory, just email me and we can chat. I’m a size 2 and I eat whatever I want…as long as they fit in my daily macros. Ok, so off my soap box. Let’s get back to this dish. Guys, this Chicken Florentine with Sun Dried Tomato Pasta was way too easy to make. This savory pasta dish came from Pinch of Yum. If you don’t follow Lindsay and Bjork, you must go now and check out their food blog. Just go to Pinch of Yum. They keep it simple and easy. And Lindsay’s writing style is amazing! I feel like I connect with her…like she’s writing directly to me! So, I took Pinch of Yum’s dish and made it with Gluten Free penne pasta and it turned out amazing. I mean…look at this picture. Who knew Gluten Free looked so good! My kids devoured this dish and said, “Yeah – worth repeating, mom.” So that’s why this Chicken Florentine with Sun Dried Tomato Pasta landed on my site! 30 minutes to make from refrigerator to table. So super easy and with a fabulous taste. It’s a must try! 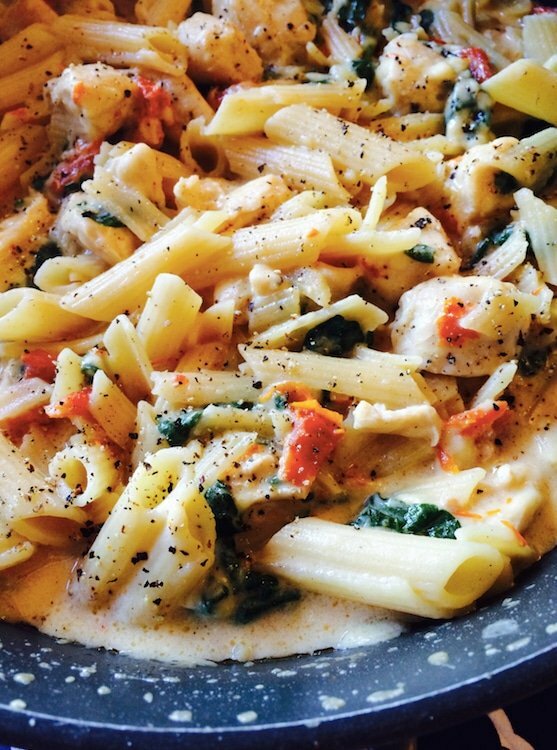 This Chicken Florentine with Sun Dried Tomato Pasta is quick and easy to make! Ready in 30 minutes, this pasta dish is loaded with sun dried tomatoes, chicken, garlic and spinach! Perfect for any weeknight dinner, you're family is guaranteed to love every bite! Gluten free option available! Heat the extra virgin olive oil over medium high heat. Sprinkle the chicken with the poultry seasoning. Sauté chicken until it is cooked all the way through. Set aside in a separate plate. Drain the oil from the sun dried tomatoes. Feel free to chop them into smaller pieces, but I don't. Add them to the pan you cooked your chicken in, along with the minced garlic and sauté for a few minutes until fragrant. Add the half and half, milk, chicken broth and Mozzarella cheese to the pan with the garlic and sun dried tomatoes. Stir until the sauce is smooth and bubbly and the cheese is melted. It should start to thicken up slightly. Add the cooked chicken to the sauce and stir. Stir in the cooked pasta and raw spinach. The spinach will start to cook down almost immediately. If you need the sauce to thicken, add more Mozzarella cheese. Stir for about 5 more minutes until the sauce is at the consistency you desire. Serve immediately. 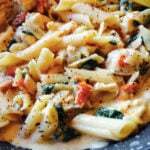 Make sure to save this savory Chicken Florentine with Sun Dried Tomato Pasta to your favorite PASTA and DINNER board on PINTEREST! This dish sounds and looks all sorts of delicious! I’ll definitely be adding it to our menu soon! Perfect for an easy dinner! Love all the inspiration you got from PoY! This pasta looks like a great dinner meal! I seriously LOVE sun dried tomatoes and this dish looks so yummy! I pinned for later and stumbled! Oh I’m so excited about this pasta dish! Thank you! This one is yummy and I too love sun dried tomatoes!! So delish!